The Northeast’s Only Progressive Rock Festival, ProgStock, is Returning to the Union County Performing Arts Center in Rahway, New Jersey, October 5th through 7th - Welcome to ACR Management! 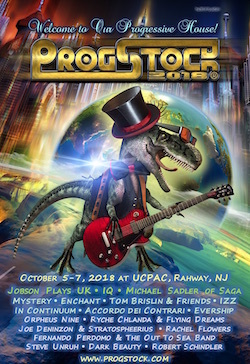 The Northeast’s only progressive rock festival, ProgStock, is returning to the Union County Performing Arts Center in Rahway, New Jersey, October 5th through 7th. Based on a strong foundation of international appreciation and respect for music and its heritage, ProgStock 2018 is an international music festival that strives to create, build and sustain a solvent and vibrant music scene. Jobson Plays UK: Returning to the stage for one night only, ProgStock presents Eddie Jobson and the music of UK as the Sunday night headliner. Best known as the legendary keyboardist and co-founder, composer and producer of progressive supergroup ‘UK,’ and as the world’s top exponent of the electric violin, Jobson’s playing and compositions have been featured on more than 60 albums with such groundbreaking artists as Roxy Music, Frank Zappa and King Crimson, as well as guest appearances with Yes, Jethro Tull and with members of Deep Purple and The Who. Jobson has brought together an all-star band for ProgStock with Jobson on keys and electric violin, Marc Bonilla on bass and vocals, Alex Machacek on guitar, and Thomas Lang on drums. IQ: With a 37-year history, IQ are widely regarded as one of the world’s most highly respected progressive rock bands. Hailing from England, the band includes Michael Holmes on guitars, Peter Nicholls on lead vocals, Tim Esau on bass, Nick Durant on keys, and Paul Cook on drums. IQ will be headlining ProgStock on Saturday night. Michael Sadler of Saga: ProgStock’s Friday night headliner, Michael Sadler, is the highly-acclaimed vocalist and frontman of legendary Canadian Prog darlings SAGA, who recently celebrated their final touring year with a special 40th anniversary appearance on the 2018 Cruise to the Edge. With 21 studio albums, awards, accolades and worldwide sales in the millions, Michael is in demand as a featured artist on many outstanding/high profile projects, and is known for his dynamic stage presence and musicianship. Michael’s latest project is a triplet EP with world-renowned pianist Rachel Flowers, who will be joining Michael on stage at ProgStock to perform the songs from their new collaboration. The ProgStock line-up also includes Mystery (Canada), Enchant, Tom Brislin & Friends, IZZ, In Continuum, Accordo dei Contrari (Italy), Evership, Orpheus Nine, and Ryche Chlanda & Flying Dreams. Friday late-night at The Waiting Room restaurant in downtown Rahway includes Rachel Flowers, Steve Unruh of Resistor, Robert Schindler (aka Robeone), and Dark Beauty. Saturday late-night at UCPAC’s Hamilton Stage Building includes Joe Deninzon & Stratospheerius and Fernando Perdomo & The Out To Sea Band. World-renowned album cover artist, Paul Whitehead, will be exhibiting his work at ProgStock 2018. Known in the progressive world for his work for the band Genesis, including covers for Trespass, Nursery Cryme, and Foxtrot, Whitehead’s art has recently graced the cover of Fernando Perdomo’s debut prog album, Out To Sea. “For me, painting”, Whitehead says, “is about questioning reality and challenging perceptions.” This is so in his painting “MUSIC?” in which an electric guitar is transformed into a sailing ship sailing towards a very active volcano and asks the question, “Music?” The painting “Music?” became the cover of Perdomo’s Out To Sea. Whitehead will be exhibiting his work and creating paintings and other art pieces live on-site, as he is inspired by the music performances at ProgStock 2018. ProgStock 2018 is capturing a diverse international fan base that includes teachers, physicians, engineers and other professionals who share an affinity for complex rock music. The genre is also attracting a growing number of young people who, largely through internet radio, are getting introduced to progressive rock’s musicianship and complexity. ProgStock’s Stage will feature music that most rock radio programmers consider too long and intricate to add to their playlists. Terrestrial radio has not collectively embraced a wave of new progressive rock bands since the second British Invasion in the early 1970s made legends of Yes; Genesis; King Crimson; Emerson, Lake, and Palmer; and their peers for elevating the genre to a higher commercial art form. The strong response to ProgStock is already proving there’s more room than ever in today’s musical landscape for a resurgence in a genre of music that began migrating underground in the 1980s. As Palmieri sees it, the decade that has passed since the demise of the record industry created more opportunity for independent artists to be heard, opening new portals for progressive rockers to rise and flourish. IK Multimedia is a multi-national company based in Modena, Italy, with business units operating in 7 countries: Italy, the United States, the United Kingdom, Japan, Mexico, Brazil and Hong Kong. Their company motto is “Musicians First”, with products sold in over 120 countries utilizing a network of 15,000 resellers and used by millions of musicians worldwide (https://www.ikmultimedia.com). Aquarian Drum Heads: “The design of the head, the integrity of the hoop, the acoustic properties of the drumhead film and the overall quality of the manufacturing are all determining factors in getting the best possible sound from a drum. Aquarian’s commitment is to make your drum sound better and more musical than the day you first brought it home.” (https://www.aquariandrumheads.com). For over 60 years, Evans has been an innovator in drumhead manufacturing and design. As the creator of the first synthetic drumhead and other revolutionary products such as EMAD, Hydraulics, and the UV1 series, Evans drumheads are designed with the intent of solving problems for drummers (http://www.evansdrumheads.com). Nestled in the heart of downtown Rahway, The Waiting Room is Union County’s legendary restaurantand bar, providing a welcome sanctuary for all who enter (www.thewaitingroom.us). ProgStock 2018 is a sponsored project of Fractured Atlas, a non-profit arts service organization. Contributions for the charitable purposes of ProgStock 2018 must be made payable to Fractured Atlas only and are tax-deductible to the extent permitted by law.